Several people riding a roller coaster at Six Flags America needed to be rescued Monday after the ride got stuck near a peak. 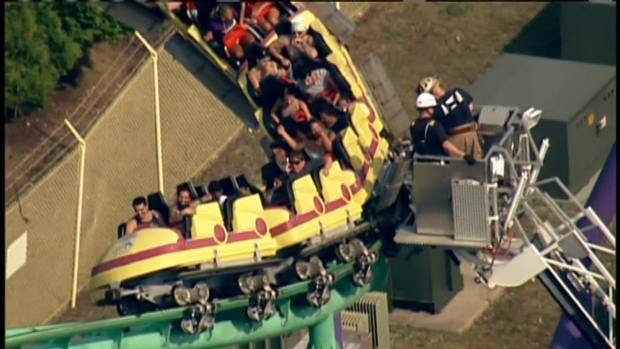 Workers at Six Flags America, in Bowie, Maryland, were able to get riders off the Superman: Ride of Steel ride, Prince George's County fire department spokesman Mark Brady said live on News4. Stomach-churning Chopper4 footage shows the ride stopped at the peak of a hill, just before it would have raced downward. A photo from a witness shows people standing on the roller coaster's tracks, high in the air. This photo from a witness shows people standing on the Superman roller coaster's track. Julia Kim was on the ground at the park with her young children when her husband got stuck on the ride. Her husband likes roller coasters, but he was scared. "He's a 40-year-old man, but I think he was crying," said Kim, a Fairfax, Virginia, resident. The family had just bought season passes to the park. Now, they don't want to go back. The fire department received several calls from people at the amusement park. By the time first-responders arrived, Six Flags staff had safely helped every rider off the ride, Brady said. There were no reports of injuries. Brady praised the staff for helping everyone quickly. "Sensors on one of our roller coasters activated, causing it to stop at a safe location," a Six Flags spokeswoman said. "All guests safely exited the ride." How long riders were stuck on Monday was not immediately clear, nor was how many people were rescued. Monday was sweltering, with temperatures in the 90s and the humidity making it feel even hotter. 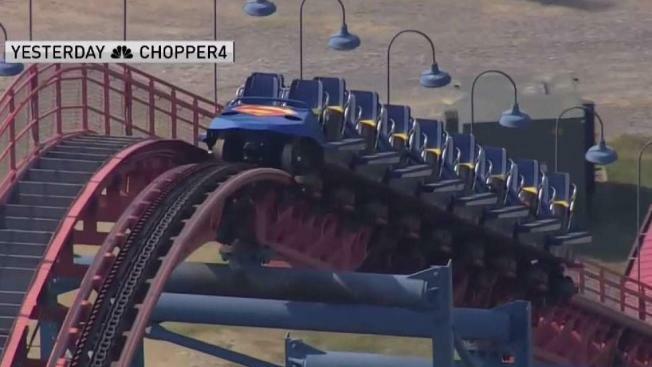 The Superman roller coaster runs through 5,350 feet of track at 73 mph in two minutes and 30 seconds, the park's website says. The ride reaches 205 feet and has a 200-foot drop. The ride was back open on Tuesday, the company spokeswoman said. Twenty-four people riding the Joker's Jinx ride at Six Flags America got stuck in midair for more than three hours in April 2017, as News4 reported. When the ride stopped, some riders initially thought it was a joke. Helpless parents waited on the ground for their children, not knowing if they were safe. The Joker’s Jinx at Six Flags America in Prince George’s County will remain closed for now after dozens of passengers got stuck 100 feet in the air for hours. News4’s Meagan Fitzgerald talked to some of the terrified riders. People also got stuck on the Joker's Jinx in August 2014. That rescue took four hours. Crews are trying to rescue 24 people stuck on the Joker's Jinx roller coaster at Six Flags America. There have been four accidents at Six Flags America requiring some form of first aid since July 2015, the Maryland Department of Labor, Licensing and Regulation said. Eight other incidents resulted in bumps or bruises. The incident Monday did not qualify as an accident because no one was hurt. The regulatory department sent inspectors to the park anyway too approve the reopening of the ride.